Whether you wear a suit all day, or drive for a living, High Noon has your concealment needs covered. Our Under Armor line of shoulder rigs are ideal for those of you looking for a versatile, yet durable shoulder concealment system. Under Armor shoulder rigs have fully adjustable straps—perfect for situations where you have to put on more layers or slip on body armor. The horizontal handgun holster orientation maximizes comfort and concealment under your suit jacket, sport coat, or other concealment garment. Gun holsters on the Under Armor are equipped with a thumb break retention strap for added pistol retention and peace of mind. The weak side magazine pouch holds two vertical mags, secured in an open-bottom position by snap pouch closures and an adjustable retention screw. The Under Armor is available in right and left hand models and is constructed of our standard black leather. 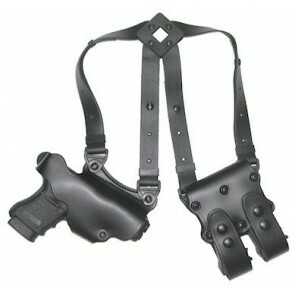 Add holster-side and mag-side tie down straps for added security during the draw or other physical activities. Are you looking for a step up in a quality shoulder rig? Look no further than our Under Taker shoulder holster. We’ve taken the simplicity and practicality of our Under Armor model and brought it to the next level. Under Taker shoulder rigs are constructed of your choice of premium cowhide or ultra-durable horsehide materials. In cowhide, you can choose between black, natural, or tan colors to fit your custom look. We can also upgrade your cowhide Under Taker with our protective lining to insure the finish on your carry pistol. If horsehide is your favored option, choose between a basic black and an old-school natural leather finish. 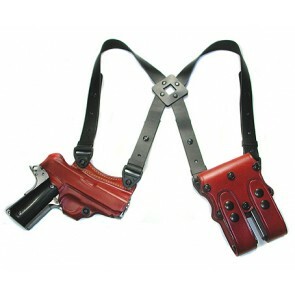 The Under Taker comes standard with fully adjustable straps and vertically oriented, dual magazine pouch. The handgun holster is positioned for a horizontal draw. A thumb break strap and adjustable retention screw ensure the security of your pistol. Under Taker pistol holsters are formed to your gun for an added level of retention and proper fit. Right and left hand models are available, as are optional tie downs for both the pistol side and holster side.